Kidney Disease – Are You At Risk? Posted on March 6, 2015 | Comments Off on Kidney Disease – Are You At Risk? While low on our radar screens, the kidneys are very important organs that play a huge role in our overall health. If you think you are not at risk for kidney disease, think again. The fact is that one in ten adults in the U.S., equating to 20 million people, currently have kidney disease, and studies show that more than half of middle aged adults are at risk of developing chronic kidney disease (CKD) at some point during their lifetime. CKD is a relatively common and life threatening illness that slowly damages the kidneys over a period of years and often goes undetected until an advanced diagnosis is made. One in three adults with diabetes and one in five adults with high blood pressure have kidney disease, making these two conditions the leading causes of CKD. Other risk factors include heart disease, aging, obesity, congenital abnormalities and a family history of kidney disease. Smoking and alcohol consumption can cause high blood pressure, increasing the risk for developing kidney disease. Additionally, pharmaceutical and OTC drugs can damage the kidneys if taken incorrectly. The warning signs of kidney disease include high blood pressure, blood or protein in the urine, more frequent or difficult urination, excess waste such as creatinine and blood urea nitrogen in the blood, puffiness around the eyes and swelling of the face, hands, abdomen and feet. Why is healthy kidney function so critical? Many of us know that the kidneys produce urine, a highly complex and life sustaining body function that is necessary to remove waste products. These hard working organs filter all the blood in your body every 30 minutes! In addition to filtering the blood and removing waste, the kidneys are responsible for regulating the body’s fluid levels, balancing pH and electrolyte levels, controlling blood pressure and calcium metabolism, generating an active form of vitamin D and producing hormones that stimulate red blood cell production. It’s safe to say that most of us would rather prevent kidney disease than treat it once it occurs. Simple urine and blood tests can tell you how well your kidneys are functioning. Early detection and treatment can slow or prevent CKD progression. With end stage kidney failure, 85 -90% of kidney function is lost, necessitating dialysis. Dialysis treatment filters wastes and water from the blood to help control blood pressure and maintain a safer level of chemicals in the blood. However, this life saving therapy can be challenging and costly. In cases of acute kidney failure, such as caused by an injury, severe dehydration or a serious illness, dialysis may only be needed for a short period of time to aid in kidney recovery. CKD necessitates dialysis for the remainder of one’s life and eventually the need for a kidney transplant is inevitable. While there are many obstacles to having a kidney transplant, including cost, long waiting lists for a healthy kidney and finding a well-matched donor, some will find they are not considered a good candidate and are therefore ineligible for a kidney transplant. As always, prevention is the key to good health. As we age, we may need to pay more attention to our lifestyle habits. Our lives, as well as our quality of life, may very well depend upon healthy living strategies. 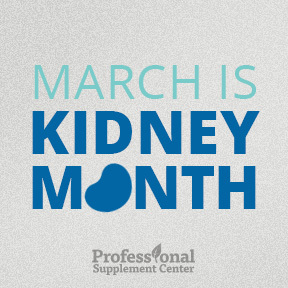 The National Kidney Foundation provides the following recommendations that everyone can and should do to maintain optimal kidney function and promote overall wellness. Additionally, for those who may already have CKD, the foundation recommends consuming protein in moderation, avoiding NSAID painkillers, and taking steps to lower blood pressure and control blood sugar levels, especially if diabetes is a factor. Renagen™ DTX by Metagenics – This product supplies a specific blend of nutritional factors and traditionally used herbs to promote healthy kidney detoxification and provide antioxidant protection. Gluten free, Non-GMO formula. Argizyme™ by Biotics Research – This product is designed to support normal kidney and bladder function with a unique, proprietary blend of botanicals, amino acids, enzymes, vitamins, minerals and organ supporting ingredients. Gluten and dairy free formula. UriCare® by Himalaya Herbal Healthcare – This clinically studied proprietary herbal formula provides soothing support for the urinary tract, promotes the normal filtration efforts of the kidneys, provides antioxidant protection and supports normal bladder muscle contraction and relaxation. This synergistically complete formula is gluten and additive free and is safe for long term use. Kidney Korrect™ by Designs for Health – This comprehensive kidney support formula contains a patented blend of kidney protective botanicals shown to improve kidney function and reduce kidney damage due conditions such as diabetes and hypertension. Gluten free, Non-GMO vegetarian formula. This entry was posted in Home and tagged Argizyme™ by Biotics Research, Kidney Korrect™ by Designs for Health, National Kidney Health Month, Renagen™ DTX by Metagenics, UriCare® by Himalaya Herbal Healthcare. Bookmark the permalink.